Just the other day, my wife was speaking to an elderly lady who is 91 years old. She has been active in the work of Christ since she was a young teen. Today she encourages, teaches and mentors other ladies and is a shining example of what it means to follow Jesus. My wife said afterwards, “We are losing a generation of great saints that truly love and are devoted to God.” After I agreed with her, I started thinking about the different generations before and after my own. 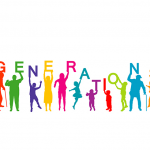 Then I considered generations long before mine and found in every generation, even though each had their own imprint and identity that defined who they were as a people, there were always those few that seemed to stand above the rest in their faith. They were truly the salt of the earth within their generation. Though I do not agree with Rick Warren on all things, I did find his views on the different types of people that make up a community of faith interesting and surprisingly accurate. He states that within the church of Jesus Christ there are five levels of maturity or devotion. The community is made up of everyone you have the potential to reach on a given Sunday. They live near your church. They’re possibly aware of your church’s existence. And they may even visit occasionally. But for the most part, they are unchurched. They likely haven’t decided to follow Jesus yet. The crowd consists of all the people who attend your church on a regular basis. They’re present a week or two per month or more. They consider themselves to be part of your church even if they haven’t joined it yet. But they’re not really involved beyond attending on Sundays. The congregation includes everyone who attends and who has become a member of the church. These are people who attend regularly, give regularly, and support the vision and values of your church. When members are growing in their relationship with Jesus and establishing the habits and disciplines of a disciple, they’re part of the committed. These believers are not only members who attend, they walk with God and are growing up spiritually. Among the committed are people who get involved and serve others through the ministries of the church. We think of these as the core. The core are generally those who give their time and their loyalty to your church. Being in ministry for much of my life I can vouch that the above five categories are alive and well. Every gathering of believers consists of one of these and to be fair, every generation is no different when it comes to following Christ. We all are very good at finding fault with the next generation and how they seem to fall short compared to ours, but the truth is, within every generation you will find the faithful few. Every generation has their fair share of hypocrites, lukewarm Christians and self absorbed people. The bible states that God wants all to come to the saving knowledge of loving him and live an obedient abundant life that only he can grant, but on the other hand, Jesus states that only a few will enter in to that kind of life. It is a fact that God has always had in each generation those that are committed and faithful but they will be few. Instead of blaming and pointing out the problems in each generation, let us examine our own heart before God and pursue to love and know him for all its worth. It is the soil of humility that will produce an abundance of good fruit for your generation. Your deep devotion to God will be the lesson that will teach the next generation what following Jesus truly looks like, and the hope is, they will follow too. ← Previous Previous post: 5 Minute Devotional – God or Religion?